Lobster slaw with chucks of lobster meat in a homemade sweet and spicy aioli sauce. Then topped with red onion and jalapenos. Topped with red roasted peppers, sautéed onions, and blue cheese crumbles. Served with a spicy three pepper blue cheese sauce. Braised short rib topped with coleslaw. Seasoned in specialty sauces, baked and then grilled to order. Red sauce, mozzarella, diced tomatoes, fresh basil. New York style, topped with red sauce, mozzarella, and pepperoni. Grilled chicken, peanut sauce, sesame seeds, sliced carrots and cucumbers. Grilled chicken, BBQ sauce, red onions, mixed cheddar and jack cheeses. Romaine lettuce, croutons, and parmesan cheese. Served with Caesar dressing. Romaine lettuce topped with cheddar and jack cheeses, tomatoes, cucumbers, red onion, and croutons. Severed with dressing of choice. Grilled chicken, romaine lettuce, croutons, and parmesan cheese. Served with Caesar dressing. Mixed field greens, romaine lettuce, carrots, cucumbers, tomatoes, dried cranberries, and mixed cheddar and jack cheeses. Served with sweet and spicy honey mustard. Topped with shredded parmesan cheese and served with spicy pickle relish. Eggrolls served with mixed field greens and habanero ranch. 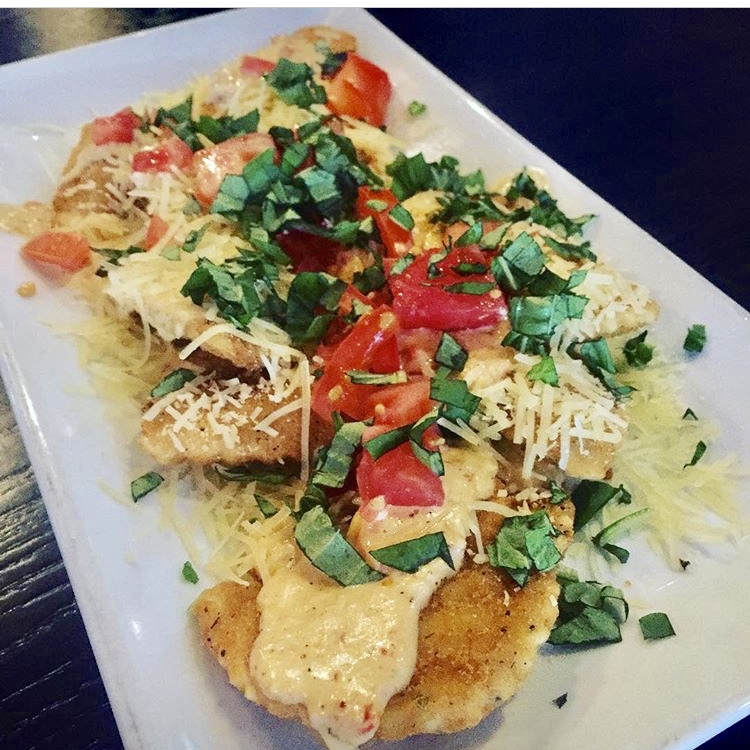 Half moon deep fried ravioli topped with shredded pecorino romano cheese, spicy three pepper blue cheese sauce, diced tomatoes and basil.